Los Angeles has always been a city whose music scene has always been ahead of the game, from the Jazz era all the way through to the 1980s Paisley Underground, there has always been a hip flavouring to the Los Angeles musical landscape. The Creation Factory are an extension of Los Angeles' rich musical past. Formed by members Shane Stotsenberg (Bass/Vocals) & Iggy Gonzalez (Drums/Vocals) who are also main players in popular neo-psych pop act The Mystic Braves. The Creation Factory formed mainly as a recording project between Shane & Iggy, before they introduced a trio of other Los Angeles and Bay Area musicians to join the fold and take the project onto the road to play shows, the current line-up also includes Organist Glenn Brigman and guitarists Neil Soiland & Gabriel Pacheco. 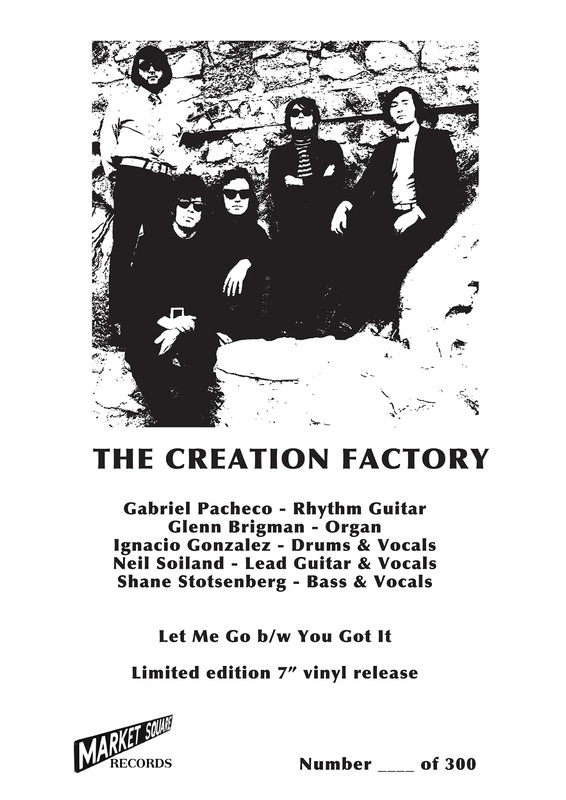 The above bunch of guys are the group who play on this, the debut 45rpm release by The Creation Factory. The sounds on this piece of wax obviously is rooted in the past and this can clearly be heard, but The Creation Factory are not like other garage-revival groups today who are "trying to sound like the 60s", they are a band from 1966 NOW... they live it. The Top side "Let Me Go" could very easily fit on the grooves of any Pebbles compilation or Highs in the Mid-60s comp, the song flows with outsider punk-isms with lyrical blasts against mediocrity such as "I just want to live my life alone so let me go", the song ebbs and flows with nice combo organ, fuzz tone guitar of exceptionally high quality and tumbling bass all held together by solid jazz flavoured drumming. The Flip an uber-cool instrumental entitled "You Got It" kicks starts like some lost Avalon Ballroom freak-out, the track is meant to represent the groups soaring live set and essentially gives the listener an insight into what the bands out-there "live" vibe. The track has a Booker T & The MG's groove to it but also sounds as though the band have just come out of playing a show at the Pandora's Box on Sunset Strip circa 67', again swirling organ and fuzz tone guitar take the spotlight, but the groove behind held together by Shane and Iggy, is quite simply astounding. 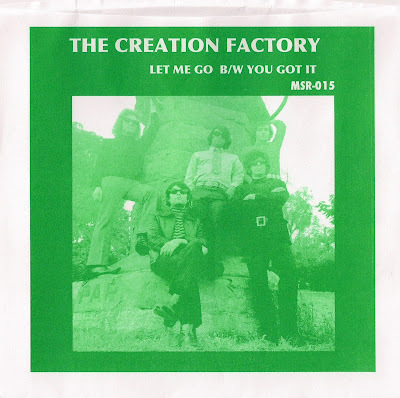 The Creation Factory are one of the few groups today, doing this music as it is meant to be done and in my book are pretty authentic and shine a light over many of their fellow peers on the 60s garage revival scene... I DIG THEM and their fluid groove and so should YOU!!!! 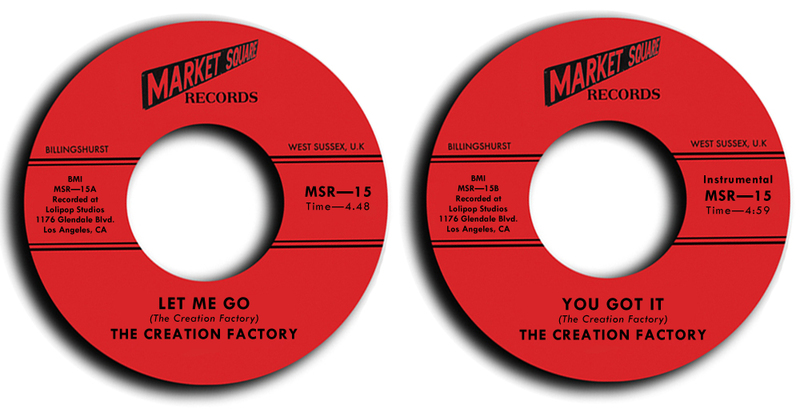 The Creation Factory 45 will be out on January 16th 2017.
and a host of other cool record shops - record stores please get in touch via Bandcamp if you want to stock copies. It will also be available via Market Square Bandcamp on the day of release. The 7" is limited to 300 copies only, each housed in a authentic 60s style paper sleeve with green print of the band on front and back, each 45 contains a limited apple green hand-numbered card insert. 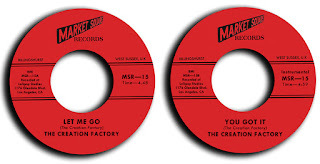 There has also been some extra spare copies pressed of this 45 and 41 of these extra copies will come with a "red" hand-numbered insert.... they will be sold after the initial press has gone.